Last week these fabulous, frugal ladies and I showed off outfits from items we had thrifted. This week we are giving you a chance to do the same! Join the link up below! For the thrifted link up I am showing off another of my favorite thrifted pieces; this pink houndstooth skirt from Loft. It was a $4 find and I have gotten so much use from it! 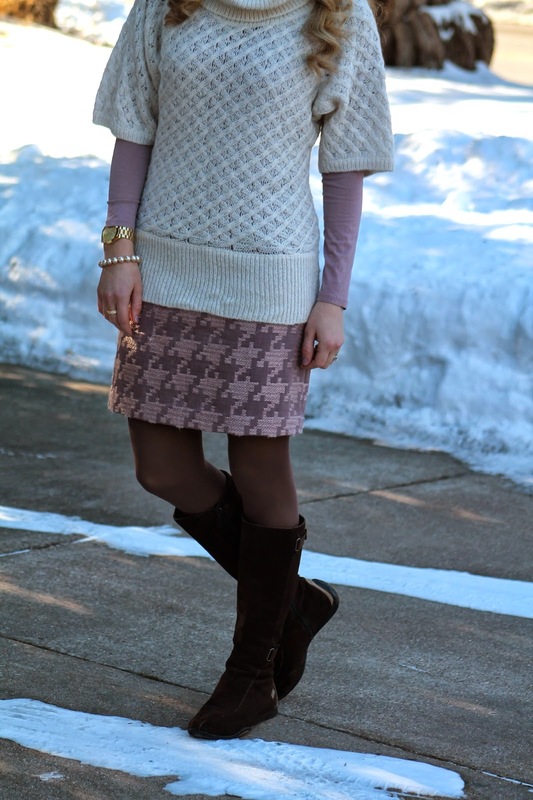 The soft pink color goes with a surprising amount of things from my closet and the similarity of the colors in the pattern even makes it easy for pattern mixing. I even did a cost per wear post on it! Make sure you check out Danielle, Jen, Lauren, and Whitney as well! This is such a pretty skirt, and what a deal at $4! I love how your layering tee matches the skirt so well. What a steal on that cute skirt and I love your sweater with the purple top popping out! i love houndstooth--and this take on it is so feminine! That skirt is a great find! I love the layering of this outfit! I love that pink houndstooth number! I can't believe you scored it for $4! I need to go shopping with you! I luv houndstooth! Really cute!! Aw man! i wish I had known about this link up! I went on my first thrift store excursion just this week!! I love your pastel layering - I am so ready for spring! Love how you layered a similar colored tee and the cream sweater. Love this layering - so pretty! I love all of this pretty purple! I have never thrifted anything before but everyone makes it look so good! The muted purple is so pretty in your sleeves and skirt. I really love the large houndstooth pattern on the skirt, too. I'm obsessed with this skirt! I love the pattern and the pink/grey colour combo! Great find for $4. I'm starting to get a bit better with thrifting. I love this idea for your blog. It's up for 2 weeks! We would love to have you link up! Can't believe it's still snowing, we are having temperature above 80 now. I recently saw this skirt on ThredUp but wasn't sure if I would have enough ways to wear it. I guess I should have bought it and used your blog for outfit inspiration! You know I have that skirt but have barely worn it and it has been close to 3 years also. I cannot seem to find it anywhere. Hopefully it will pop when I completely move from Winter to Spring closets. Sorry I got behind reading with your blog but I did a little traveling. Hello from the States.